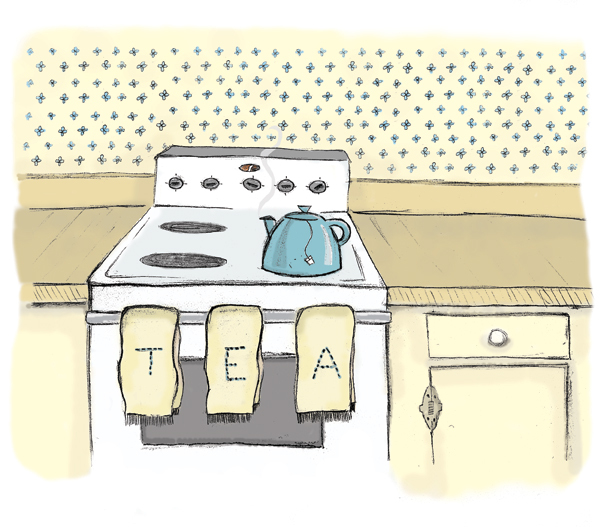 Diversions: Illustration Friday - "Tea"
Another little illo for Illustration Friday! This one is pretty simple, but I like the way it turned out okay! Please click on illustration to see the detail! Say, that looks like your apartment. I love it. Simple. Great line quality. Lovely subdued colours and a darned good idea. oh this is very nice. love the simplicity and peacefulness. The kitchen has a nice, old-timey look to it. Great little illo. i love how detailed yet simple this is and the calm colors and of course the tea towels! Very clever! This would make a cool print! I like your colours in this...also like your header image too. Excellent and simple! Nice work here. I like it, too. It seems very cozy, and I've always thought that ambience and atmosphere were the most difficult to illustrate.